The morning started out with the $2,500 USHJA National Hunter Derby, presented by Legend, and Wesley Wilson’s Whitney, ridden by Julie Curtin of Woodstock, Georgia, galloped away with the blue besting thirteen horse and rider teams to win the class with a combined score of 182. Curtin and Whitney led the class after posting the highest round score of 90 and maintained their lead in the Handy round after earning a second round score of 92. Naddel, owned by Hilary Baylor and ridden by Daniel Geitner of Aiken, South Carolina rode home with a second place finish, after posting a first round score of 86 and a second round score of 91 for a combined total of 177. Right behind Geitner and Naddel and grabbing the third place ribbon was Karen Bailey’s Troubadour, piloted by Sarah Milliren of Jenks, Oklahoma, after earning a first and second round score of 88 for a combined total of 176 points. Cheryl Rubinstein’s Capisce, ridden by Ashley Hotz of Eads, Tennessee, placed fourth after earning a first round score of 87 and second round score of 85 for a combined total of 172. Cappriccio, owned by Samantha Kench and ridden by Carolyn Bell of Alpharetta, Georgia, earned a fifth place ribbon after posting a first round score of 89 and second round score of 74 for a combined total of 163. Sixth place honors went to Charisma, owned and ridden by Shea Taylor of Germantown, Tennessee, after earning a combined score of 157, and seventh place was awarded to Sue Gibbs’ Gioia, ridden by Vick Russell of Columbus, North Carolina, after posting an overall score of 155. Stephanie Von Bidder of Aiken, South Carolina piloted her own Ariana to an eighth place finish, while After Party, owned and ridden by Caitlin Davies of Milton, Georgia, placed ninth. 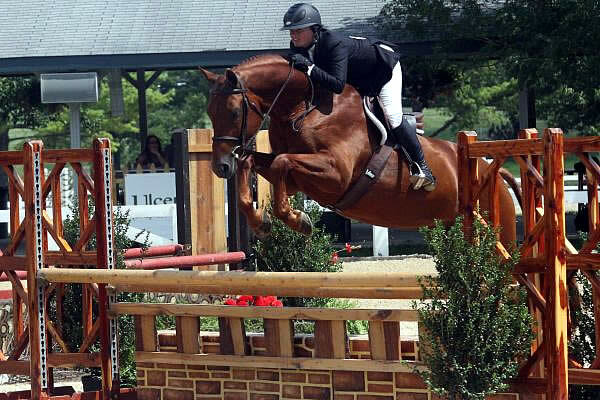 My BFF, owned and ridden by Erin Cummins of Carmel, Indiana, placed tenth, and Tim Sweat of Milton, Georgia and his own Autograph placed eleventh. Perfect Gentleman, owned and ridden by Brittany Wyatt of Fayetteville, Georgia, wrapped up the class in twelfth place. Friday night the $10,000 USHJA International Hunter Derby took to the Olympic Arena over a beautiful course designed by Classic Company Course Designer Joe Carnicom. More Optimistic, owned by Maida Clifton and ridden by Ashley Hotz of Eads, Tennessee, stole the show and took the win after earning an overall score of 348. Daniel Geitner of Aiken, South Carolina took both the second and third place ribbons with True Story, owned by Kelly Sims and Jordan Carlson’s Avignon, both earning overall scores of 341; however, True Story was awarded four bonus options in their Handy round which secured the second place ribbon. Valentine, owned by Liddy Strickland and ridden by Sarah Milliren of Jenks, Oklahoma, placed fourth with their combined score of 331, and fifth place went to Tall Paul, owned and ridden by Vick Russell of Columbus, North Carolina, with an overall score of 324. Milliren returned to the winner’s circle, this time in the irons of Liddy Strickland’s Judgement Call for the sixth place ribbon after posting a combined score of 310, and seventh was awarded to Chuck Waters’ Caruso, ridden by Ashley Scott Armstrong of Atlanta, Georgia. Geitner returned to collect the eighth place ribbon with Allison Mills’ Sky Pilot, and ninth was awarded to La Roxx, owned and ridden by Isabel Harbour of Alpharetta, Georgia. “We all really enjoyed watching the hunters compete under the lights in the Olympic Arena,” commented Bob Bell. “The course was just stunning,” he added. Lexington, Ky. – The USHJA and the USEF have announced that there will be no Federation-generated protest measurements of equines competing in hunter and jumper divisions in the 2015 competition year. This moratorium on Federation-generated protest measurements does not preclude members from protesting other members during the 2015 competition year. As discussed at the annual meetings, USEF and USHJA are dedicated to producing a better equine measurement system. It is our goal to develop a fair and accurate system for our members. Numerous issues have been identified and will be addressed over the 2015 competition year in order to have a new system in place for the 2016 competition year. The USHJA and USEF encourage all owners and trainers to do their due diligence in conducting any purchase or lease transactions involving equines that require measurement to compete at USEF licensed competitions. We will keep our members current as we develop resolutions to these issues. Wellington, FL – February 20, 2013 – Polish those boots, prep those horses and clean that tack, to get ready for the USHJA Zone 4 Free Clinic that is less than a week away. Open to all amateur riders in USHJA Zone 4, this clinic will take place on Monday, February 25, at the Jim Brandon Equestrian Center. Cynthia Hankins will be the clinician for the event. Hankins, a Pennsylvania native, comes to the clinic with an extensive riding and showing resume. 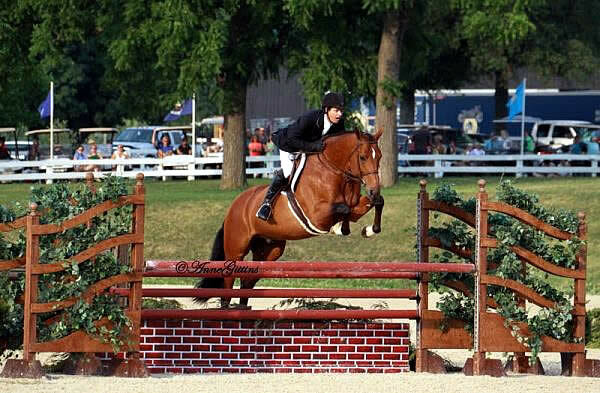 Throughout her junior career, she achieved many prestigious awards including the USEF Hunter Seat Medal and being named Best Child Rider at the Pennsylvania National Horse Show. The Floridian Community Bank USHJA Zone 4 Free clinic will be broken down into four groups: a group at 2’6″, two groups at 3″, and a final group at 3’6″. The spots are filling up fast as amateur riders across Zone 4 try to reserve a spot in their group. However, there are still spaces available to amateur USHJA Zone 4 riders only by contacting dudeville@bellsouth.net. There has been a growing interest in the clinic from professional riders; however, this clinic is only open to USHJA Zone 4 amateur riders. The professional riders that are interested in attending are more than welcome to audit the clinic for free. To view video segments from EquestrianCoach.com featuring Cynthia Hankins, please visit: http://www.equestriancoach.com/content/form-follows-function and http://www.equestriancoach.com/content/form-follows-function-over-fences. Classic Company is proud to announce that its President, Bob Bell, was recently asked by United States Equestrian Federation’s President David O’Connor to take his seat on the American Horse Council’s Horse Show Committee. In this capacity, Bell will replace O’Connor and represent both the United States Equestrian Federation (USEF) and the United States Hunter Jumper Association (USHJA) on the Council’s Show Committee. “I am very excited and honored that David selected me as his replacement,” commented Bell. “I take this responsibility very seriously and will represent both the USHJA and USEF to the best of my abilities,” he added. The American Horse Council is a trade organization in Washington, DC representing the horse industry. The organization lobbies before Congress and Federal agencies for the interests of the horse industry, and serves as a unified voice for the equine industry. Bell’s position of representing both the USEF and the USHJA on the American Horse Council’s Horse Show Committee is critical in the promotion and advancement of the hunter jumper sport in the country. Furnace, PA – July 3, 2012 – The 2012 State College Classic saw an overwhelming victory from SBS Farms, Inc. last week. Jennifer Alfano dominated the professional divisions with her top mounts, as well as securing the first place award in the $10,000 USHJA International Hunter Derby with the talented Jersey Boy. Luke Olsen caught the judges’ eyes in the equitation classes, earning the first place prize with Serenade in the Pessoa USEF Hunter Seat Medal. Jessica Liffin took the Low Junior/Amateur Hunter Reserve Championship aboard Imparco. In the Regular Conformation Hunters, Danny Robertshaw’s Lions Paw with Alfano in the irons stole the show. Lions Paw was awarded the blue ribbon for his beautiful conformation in the Model. Alfano then guided the thoroughbred to the first and second place ribbons over fences, as well as the first place award in the under saddle. They eventually secured the division’s reserve championship honors. Alfano also exhibited Dragon, owned by Redfield Farm, to two second place finishes in the over fences and the handy round. Lexington, KY – June 20, 2012 – Professional rider Peter Pletcher once again captured the winning honors with NLF Shakespeare’s Rhythm in a derby event. The pair earned the top call during the $30,000 USHJA International Hunter Derby at the Country Heir Horse Show for Nordic Lights Farm and the Bruheim Family. A flawless handy round helped them receive high scores and eventually head the event’s victory gallop. Pletcher and NLF Shakespeare’s Rhythm’s smooth trip during the first round landed them in the second place position going into the handy round during the $30,000 USHJA International Hunter Derby. Using an inside track to slice one of the oxers and jump brilliantly through the challenging two-stride, the duo quickly jumped to the top of the leaderboard with their high scores and added bonus points. Pletcher and NLF Shakespeare’s Rhythm’s earned the winning title and led the evening’s lap of victory in the Walnut Ring of the Kentucky Horse Park. Lexington, KY – May 12, 2012 – The night was filled with anticipation and excitement as the nation’s top hunter riders gathered beneath the lights of the Rolex Stadium tonight at the Kentucky Spring Horse Show. The evening began with the $5,000 Hallway Feeds USHJA National Hunter Derby where renowned hunter rider Louise Serio took the championship prize aboard Corvine. The $15,000 USHJA International Hunter Derby turned into a nail-biter as 14-year-old Victoria Colvin went neck and neck against Jennifer Alfano, with the junior rider eventually emerging victorious. Riders were tested over a classic hunter course designed by Bobby Murphy, and the top 12 scoring combinations advanced into the handy hunter round. The course was beautifully set, and was reminiscent of a hunt field. The two-round course included stonewalls, oxers, standalone verticals, gates, brushes and an in-and-out. Four high options were offered to the riders as a way of earning additional points on their base scores. The decision to take the higher option came down to whether or not the horse would still be able to demonstrate their style and grace with effectiveness. Additional points were also awarded to riders who demonstrated “handiness” and an elevated amount of difficulty. 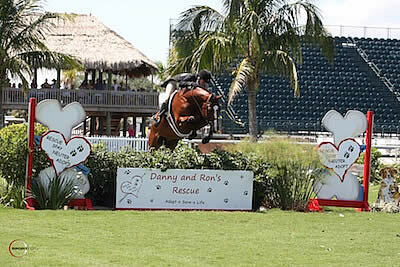 Wellington, FL – April 1, 2012 – The 2012 FTI Consulting Winter Equestrian Festival drew to a close today. The feature attraction of the day was the $50,000 USHJA International Hunter Derby at The Stadium, and Kelley Farmer rode Nancy Amling’s Taken to victory. Competition concluded in the International Arena on Sunday with the junior and amateur-owner jumpers competing in their final classics. Beginning the morning, Abigail McArdle jumped to victory in the $10,000 Griffis Group High Junior Jumper Classic aboard Bravoman. 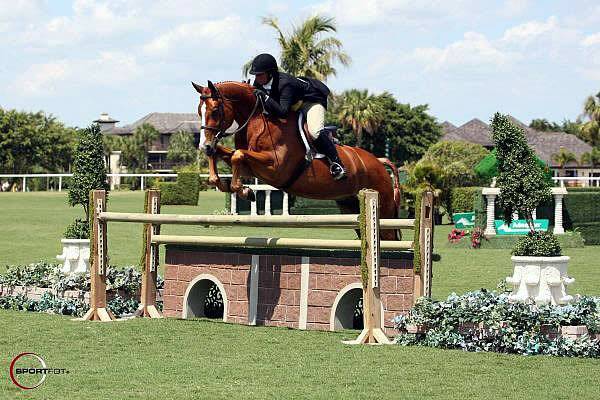 Cara Dayton and Caballero 81 earned top honors in the $10,000 Charles Owen Low Amateur-Owner Jumper Classic, and Alexandra Crown and Can Be Good won the $10,000 South Florida SportChassis Low Junior Jumper Classic. In the Beval Palm Beach Adult Medal, Tracey Mack-Gorin won the final class, while Devon MacNamara won the circuit award. 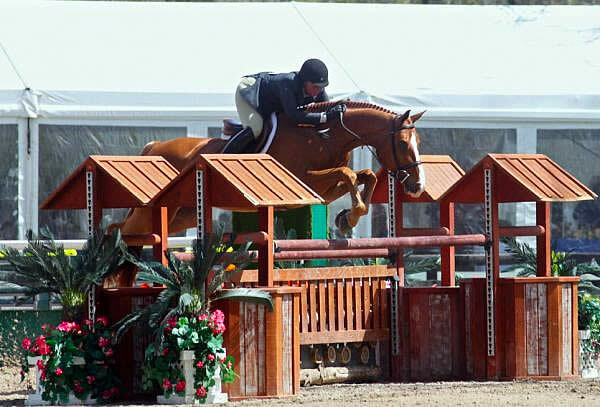 Schaefer Raposa wrapped her last week with wins in the Marley Goodman Small and Antares Large 16-17 Junior Hunters. Ocala, FL – March 12, 2012 – It was an incredible night for the 2012 $10,000 USHJA International Hunter Derby at the HITS VI Ocala Winter Finals. Spectators gathered together as the anticipation continued to rise, waiting to see who would take home the victory. In the end, it was SBS Farms’ Jennifer Alfano who executed brilliant rides throughout the two-round event, rising to the top of the leaderboard with four horses. She and her veteran mount Jersey Boy took the top honors and led the victory gallop, proving unbeatable throughout the competition. Alfano also guided Miss Lucy to the second place finish, completing flawless rounds and earning top scores from the judges. The evening began as riders were tested over a classic hunter course, with the top 12 horse and rider combinations advancing to the handy hunter course. The scores earned in the classic hunter round were combined with the handy hunter round, combining the two round totals for the event’s overall results. The course definitely proved to be no easy feat. It mimicked a picturesque hunt field, testing horse and rider alike as they navigated the course and vied for the top honors and the chance to make it into the esteemed top 12. Jersey Boy took an early lead with the high scores in the first round totaling 187 points from the panel of judges, and Miss Lucy did not fall far behind with her first-round score of 170 points. Lexington, KY – March 8, 2012 – The Kentucky Horse Shows are pleased to announce the newest addition to their spring and summer horse shows, the Hallway Feeds USHJA National Hunter Derby Series. The six-part series will feature a $5000 Hallway Feeds USHJA National Hunter Derby at the Kentucky Horse Park throughout the spring and summer, and at the conclusion of the series the Leading Rider Awards for the Series will be presented.